This is a 3 minute read. Do you consider yourself immersed in the creation of content? Do you find that, as you create content, you sift through a great deal of other-content in order to bring meaning to your own thoughts and share those with others? If you do, welcome to the world of content curation! I had the opportunity to dive into content curation during Content Curation: Making Meaning Out of Chaos at Info360 and I'm delighted to share some of those highlights with you here. Before doing so, I offer many thanks to Pawan Deshpande and Arnold Waldstein for a successful and thought-provoking discussion re: content curation and making meaning from chaos. You'll learn a great deal from them by spending time on their sites! Details are below. Arnold, Pawan and I discussed content curation intensely in preparation for your session. Out of those conversations, I extracted several Content Curation tips or best practices for you to think about as you get started curating content. Content curation involves collecting content that meets specific search criteria, selecting the best, synthesizing, adding a specific perspective or slant [to provide context & meaning] that appeals to a specific audience, and sharing it online. Specific perspective comes from the human element [i.e., the content curator] who establishes the credibility and trustworthiness of the curated content. As the curated content develops credibility and trustworthiness, it invites interaction and builds community; the content curator then becomes community manager. 1. What does the competitive landscape look like? 2. Does your proposed topic resonate with your intended audience? 3. Is there enough content to curate? Without an audience, your content is useless! Never forget your audience! Focus intensely on how you can offer them consistent value. 1. Collect content based on specific criteria. 2. Synthesize, organize, simplify. Combat the ‘Paradox of Choice’. 3. Offer a distinct, but consistent point-of-view. 4. Be relevant & meaningful. If your audience can't share your content, what's the purpose? Make it easy to share: offer your audience a range of traditional and social options for sharing your content. The benefit is that it extends the content and the conversation. In the case of eMail sharing, your visitor has “invited you into his/her inbox”. How might you build engagement & community? Ethics count in content creation and curation. Think bigger picture, bigger than your business when curating content. My favorite: quality matters more thatn quantity when curating content! Focus on quality rather than quantity. Otherwise, you contribute to the noise and chaos rather than bring meaning and provide context. If you are interested in our presentation, I've included it here. 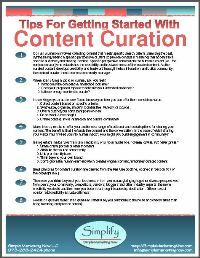 If you'd like more information about content curation, I invite you to download the resources we put together for our session. Simply click on this link for downloading content curation resources from Info360. Topics: content curation, How Do I Get Started?